Rapid PBR Material Creator is an addon that simplifies the creation of PBR materials to a SINGLE click! Great to use with Substance Painter. Never waste your time dragging multiple textures from the directories to Blender one by one again. 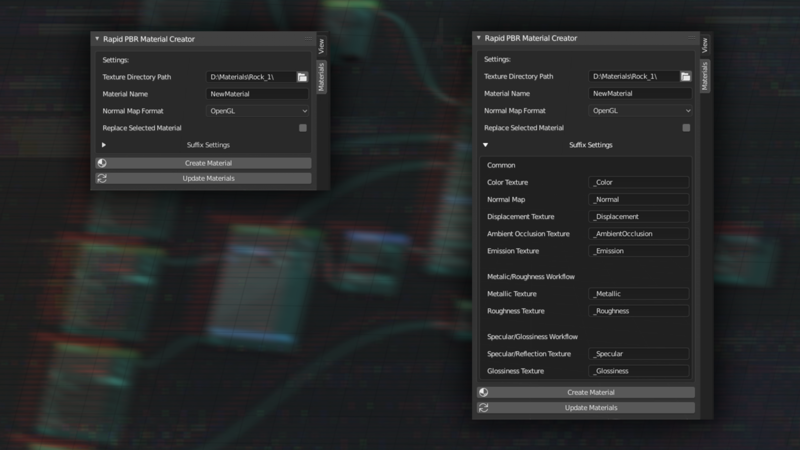 Forget about tweaking and joining tones of nodes to create one material. Just choose a directory with textures you want to create a new material with, set material's name, click "Create Material" button and you are done. Did you edit textures externally in Photoshop for example? Or baked new version of textures in Substance Painter or other software? You can reload them all with just ONE click! Without this addon you need to reload each texture individually that is absolutely frustrating and extremely time-consuming process. It cannot be guaranteed that this addon will be stable in 100% until the official release of Blender 2.8 since current rendering system (in LookDev mode and Rendered mode) causes crashes occasionally. Path to the directory from which the textures for a new material will be loaded. Name of the material that will be created. Blender uses OpenGL normal map format so if loaded normal map is saved in DirectX format its green channel needs to be inverted for the proper effect else it will be concave instead of convex and vice versa. If unchecked then the new material will be created and added to the selected objects in a new material slot. Textures need to have a proper suffix to be loaded properly. For example "_Color" suffix for base the color texture or "_Roughness" for the roughness texture. However, you can easily set our own custom suffix for each texture. Your setup will be saved in .blend file so you do not need to tweak this every time you open Blender. NOTE: This addon supports both Roughness/Metalness and Specular/Glossiness PBR workflows. However Blender uses Roughness/Metalness workflow only. Using Specular/Glossiness workflow may result in slightly incorrect look of the material. NOTE: Textures for each material need to be stored in separate directory. I have a question about the addon or I found a bug, what I can do? Please contact me on Blender Market directly or send an email to the address provided in a license file.